No microcontrollers or digital emulation present; the Mutant Chicken actually chooches a real chicken for that pure, analog tone! Just like the other Mutant Drums, there is a eurorack-compatible Trigger input to activate the chicken. Longer gate durations mean longer squawks. 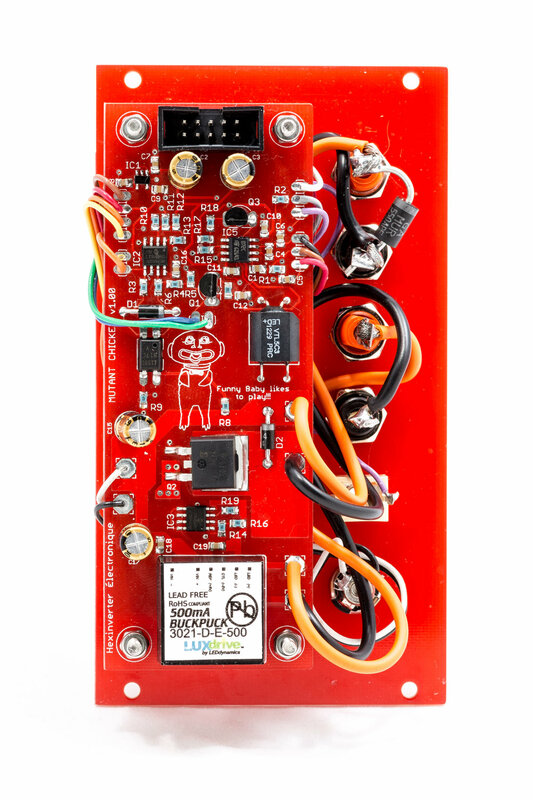 A hi-fidelity mic capsule buried in the depths of the chicken's body captures all of this analog warmth and amplifies it up to modular-levels for processing through your eurorack system at the SQWK OUT jack. Pneumatically-driven for maximum power; a massive tank means you should never run out of Squawk energy. Utilising high-power modern LED technology, the Mutant Chicken features 9watts of voltage-controlled LED power for sensory feedback! A custom driver circuit takes eurorack level signals and converts them into up to 300 lumens of radiant luminosity. New Old Stock analog opto-isolator (vactrol) technology adds that distinctive analog slew to the Brilliance CV, while also protecting your modular system from complete destruction.